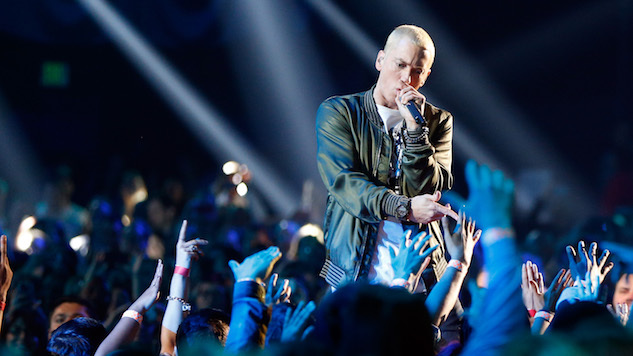 When Eminem wrote the lyrics to “Lose Yourself” for the soundtrack of his 2002 film 8 Mile (“His palms are sweaty / knees weak, arms are heavy / There’s vomit on his sweater already, Mom’s spaghetti”), he probably didn’t anticipate the cultural impact his words would have on this generation. But now that the phrase “mom’s spaghetti” has proven to be the most essential line from that song and movie, why not capitalize on its success? Eminem opened a “Mom’s Spaghetti” pop-up restaurant at The Shelter music venue in Detroit over the weekend, where fans could listen to his latest record Revival, which came out last Friday, buy exclusive merch and, of course, eat spaghetti. Thankfully, Union Joints, the company that catered the event, served actual spaghetti, rather than vomit, and it was available with or without meatballs or as a “s’ghetti sandwich.” Slim Shady himself even dropped in to promote his album and sign autographs. Check out the menu for the pop-up below via an Eminem tweet, along with an Eminem performance from the Paste Cloud. Read our review of Revival here.